A lorry driver who was seriously injured when his vehicle crashed into a stationary coach on the M5 has died in hospital. Police said he was a 65-year-old man from Somerset. One of the bus passengers, a 35-year-old from Smethwick, died at the scene on Saturday. Another man remains in a critical condition. 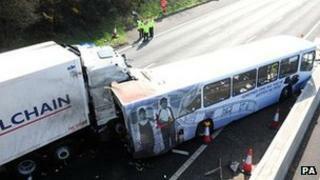 West Midlands Police arrested and bailed the 49-year-old coach driver following the collision in thick fog. Detectives said the man, from Birmingham, had been questioned on suspicion of causing death by dangerous driving. It is understood the bus had broken down on the inside lane of the motorway, in a section where roadworks are being done between junctions 3 and 4, near Frankley Services. The lorry driver, who was travelling from Manchester to Devon, died in hospital just after 21:00 GMT on Saturday. West Midlands Ambulance Service crews treated 40 adults at the scene, 27 of whom were later transferred to four nearby hospitals. One of the bus passengers remains in a critical condition with serious head injuries and multiple leg fractures. Thirty four passengers - men and women - were on board the bus. The single-decker vehicle was carrying fruit workers from Birmingham to the Evesham area of Worcestershire. Ch Insp Carl Flynn, of the Central Motorway Police Group, said it had broken down on the motorway minutes before the accident. Speaking at a press conference on Saturday, Mr Flynn said a 999 call had been made by a member of the public, reporting the stranded coach about 12 minutes before the crash.